I value audience participation, so I asked the Horror from Outer Space if he were given the choice between chocolate peppermint muffins and chocolate coconut muffins, what would it be? “Bacon muffins” he said. 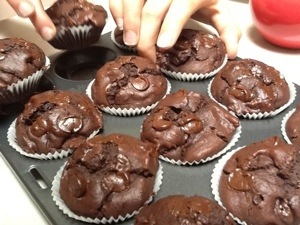 I think if you’re going to make chocolate muffins, you may as well go all out and make chocolate with chocolate chips. I went looking for recipes, and loosely based my first version on that of an American woman who was making these as a healthy treat for her son who was going off to college. Should I even comment on that? Perhaps not. They were OK, and have been eaten, but required work. The recipe I provide here is more satisfying. Take a metal bowl and melt about sixty grams of butter in it by sticking it in the oven which you’ve turned on to preheat. I do like avoiding washing up. Once it has melted, you’ll want to leave it to cool for a bit so you don’t cook the egg too early. My original version used oil at this step, but the butter makes it richer. Add a half a cup of milk and an egg and beat it all together. If you’re going down the chocolate peppermint route, add half a teaspoon of peppermint essence to the mixture now, no more, that stuff is strong. Now the dry ingredients. Add a cup of flour, one quarter of a cup of cocoa, one third of a cup of sugar, one quarter of a cup of chocolate chips, two teaspoons of baking powder, one teaspoon of bicarbonate of soda. If you’re going down the coconut route, add a quarter of a cup of desiccated coconut here. You don’t have to do coconut or peppermint, but I wouldn’t advise doing both. Mix thoroughly, and spoon into those little pattycake cases, I don’t want my kids eating large sized ones of these. It makes twelve if you fill the cases up, then you’ll get those nice muffin tops, rather than the ones resulting from eating too many muffins. I would normally then top with about three chocolate chips per muffin for an even more exciting top, but I got to the bottom of the packet and am resisting opening the big packet I got from Chef’s Warehouse. Bake at 180 degrees for about twenty minutes. When you’re testing for doneness with a skewer, make sure you haven’t stabbed one of the chocolate chips, because that will give you the wrong idea. And now, if you’ll excuse me, I must return to basting my batting.